6th of October (Egyptian Arabic: السادس من أكتوبر‎ El Sādis Min Uktōber; colloquially known as ستة أكتوبر Seta Uktober) is a city in Giza Governorate, a satellite town and part of the urban area of Cairo, Egypt, 32 km (20 miles) outside the city. It has a population ranging between some 185,000 in the city to an estimated 500,000 inhabitants in the wider area. 6th of October was the capital of the now defunct 6th of October Governorate. A new city in the desert, it hosts Egyptian students and students from various countries, such as the Persian Gulf, Jordan, Nigeria, Cameroon, Syria, Iraq, and the Palestinian territories, who study at its private universities. The settlement was established in 1979 by the 504th presidential decree of Egyptian president Anwar El Sadat. It is 17 km (11 mi) from the great pyramids of Giza and 32 km (20 mi) from downtown Cairo. The city has a total area of 482 km2 (119,200 acres) and, eventually, is expected to have 6 million inhabitants, although there are many unoccupied or incomplete buildings. 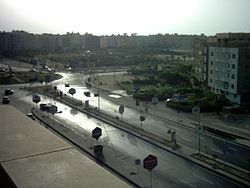 It was announced as the capital of the 6th of October Governorate in April 2008. Following the governorate's dissolution in April 2011, in the wake of the Egyptian revolution, it was reincorporated into the Giza Governorate, to which it had originally belonged. The city's name commemorates the commencement of the October War on the 6 October 1973, the same date chosen as Egypt's Armed Forces Day. 6th of October is the headquarters of the Confederation of African Football. It hosts Egypt's Smart Village, the technology park and regional hub for many companies in the IT and financial sectors. 6th of October City has one of the largest industrial zones in Egypt on which the entire city is established. The industrial zone provides jobs for employees within the city as well as from other parts of Giza. It is accompanied by a banking sector that groups branches of all banks in Egypt in an area that is close to the industrial area to serve the needs of the industry and residents. 6th of October Airport is used for the transport of products and materials to and from the city. The city also houses four industrial zones. There are seven private universities in 6th of October City, including two private medical schools at Misr University for Science and Technology and October 6 University. The city has several teaching, public, and private hospitals as well as many smaller clinics. Eden Healthcare Orthopidic surgery, Rehabilitation, & Wellness. The city is served by many mosques, the largest being El Hosary Mosque on El Tahrir St. There are several churches in 6th of October. The most famous of them is St. Mary and St. Merkurious Church. The city has a wide variety of entertainment and leisure activities for families and individuals. There are eight mega malls (four under construction), as well as many small malls and centers with an average of three for each city. 6th of October has 10 cinema complexes, 4 of which are under construction. There are nine sporting clubs. The city has two paintball fields (Adrenaline Paintball and KEE Action Park). There are two amusement parks: Dream Park and Mega Park (under construction). Camp X-treme is a team building venue, family picnic park and camping facility for kids and adults. ^ "To Catch Cairo Overflow, 2 Megacities Rise in Sand" article by Thanassis Cambanis in The New York Times August 24, 2010. Retrieved August 25, 2010. ^ Emporis GmbH. "6th of October City - Buildings - EMPORIS". emporis.com. ^ "6th October City". New Urban Communities Authority Portal. Retrieved 30 October 2016. ^ "Climate: 6th of October - Climate graph, Temperature graph, Climate table". Climate-Data.org. Retrieved 16 August 2013. ^ "Contact Bavarian Auto Group". Bag-eg.com. Retrieved 2011-02-02. ^ "Contact Coldwell Benaker New Homes Egypt". Archived from the original on 19 May 2011. Retrieved 2011-05-19. ^ Satyam. "Welcome to GMArabia Corporate Information". Gmegypt.com. Retrieved 2011-02-02. ^ "Seoudi Group 1001 opportunities for investment in Egypt and Arab World". Seoudi.com. Archived from the original on 1 February 2011. Retrieved 2011-02-02. ^ "Aller Aqua Factories and Sales Offices". Aller Aqua. Retrieved 30 October 2016. ^ "New Egyptian Factory Press Release". Aller Aqua. Retrieved 30 October 2016. ^ "AASTMT - Smart Village Campus". Retrieved 21 February 2018. ^ "Home." American International School in Egypt West Campus. Retrieved on January 25, 2015. "AMERICAN INTERNATIONAL SCHOOL IN EGYPT WEST CAMPUS Sheikh Zayed City Entrance 2 Greens Compound"
^ "Contact Us." International School of Choueifat 6th of October City. Retrieved on 24 January 2015. "The International School of Choueifat - City of 6 October, Egypt Dreamland, City of 6 October, Al Giza, Egypt"
^ "Heritage International School". www.heritageinternationalschool.com. Retrieved 2016-07-08. Wikimedia Commons has media related to 6th of October City.